A professor I had in college once said to me that, “Education is something people will pay more for, but want less of.” I hear these words echoing through my mind as I step out of my vehicle at just about every shopping complex in the state. People are willing to pay incredible amounts of money for landscaping and will pay even more, on a seasonal basis to preform incorrect maintenance that undermines their green investment. These improper methods will shorten the life expectancy of their tree and can encourage pests and diseases on to the property. We struggle in our mission, but are dedicated to educating even those in our own profession that ascribe to these detrimental practices, and have come to realize that homeowners are following the deplorable examples that they see in parking lots and commercial complexes. 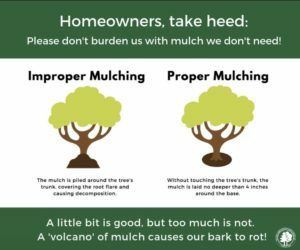 No tree should ever have any mulch against its trunk for any reason and no more than 4″ of mulch should be under a tree at any time. In an ideal world the mulch ring would extend to the dripline of a tree. The dripline is defined as the outermost circumference of a tree canopy where water drips from the leaves onto the ground. This is not always practical, but always try to make your mulch ring as wide as possible. Typically a 2-3′ ring for young trees and a 6-8′ rings on older ones. Not only will you substantially prolong the life and health of your tree by mulching properly, but there is additional savings to be gleaned as well, because way less mulch is needed to achieve this than is typically applied. Just a little adjustment in our practices go a long way. The Windridge Team Members are dedicated to installing healthy trees and keeping them so. We can also help mitigate & at times even reverse the damage that trees that have been mulched improperly suffer. 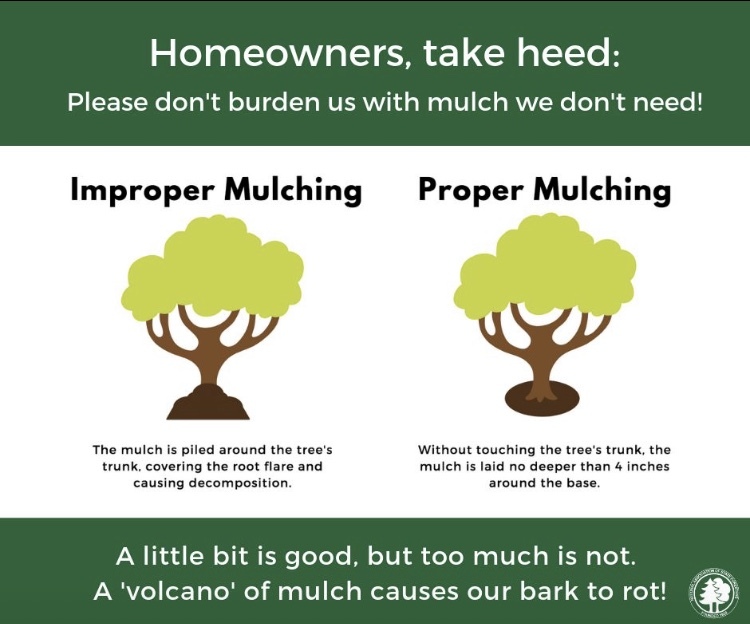 Mulching the right way will not cost you more, even potentially less. 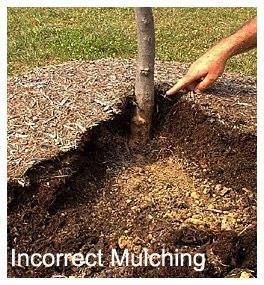 Mulching improperly will cost you your tree.